A well-planned gallery wall can alter the whole look and feel of a room. It can turn a dull, barren space into a place with energy and unique personality. But most importantly, it’s a practical, space-efficient way to show off a collection of art that means something to you and evokes emotions. 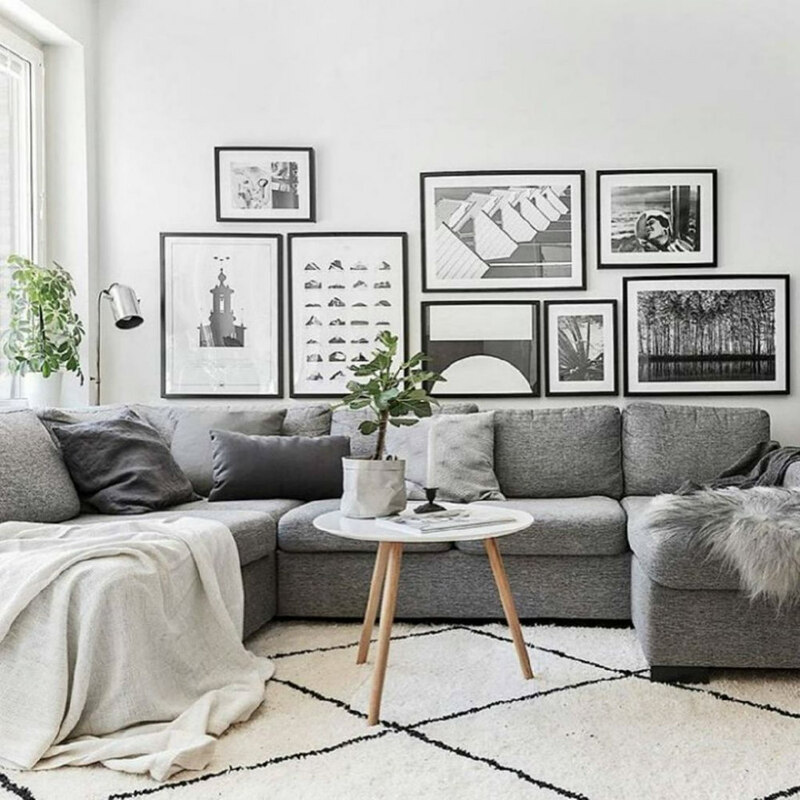 If you’re aiming to create a modern Scandinavian look, then geometric art, abstracts, line drawings, botanical prints, and nature photography can all work well. On the other hand, if tan leather sofas and hairpin-legged tables are more your style, mid-century modern inspired prints will be a better fit. This came out a little long, so I made up a table of contents to help you find everything. Just click to skip to a section. 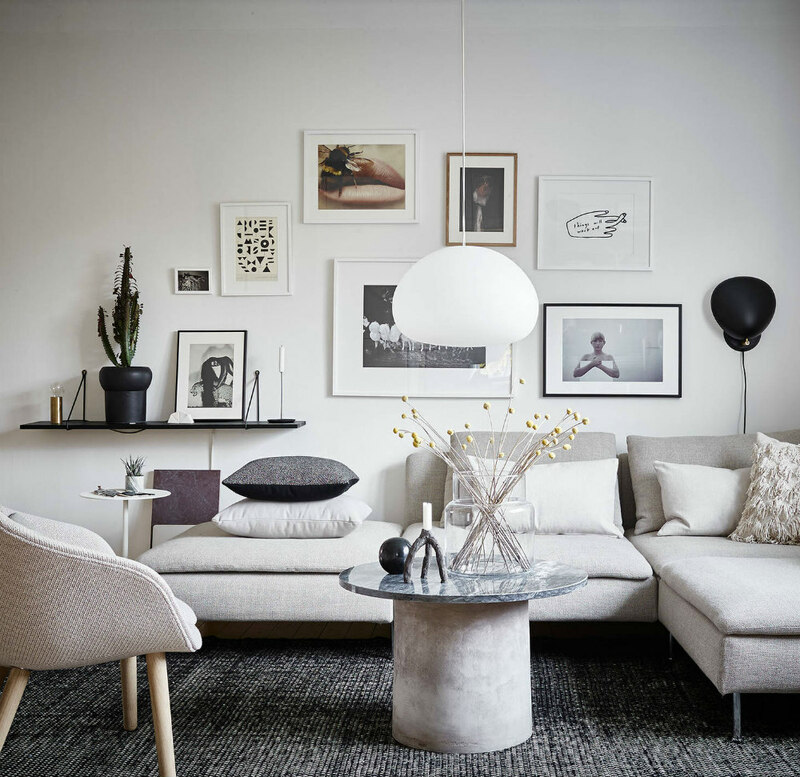 A Swedish living room with a gallery wall that bridges the old and new in the room. The wall above a sofa, bed, cabinet or dining room table are all good if you want to make your gallery wall the focal point of the room. An unusually shaped nook, a corner or a staircase wall are often overlooked, but they’re perfect spots for artwork. 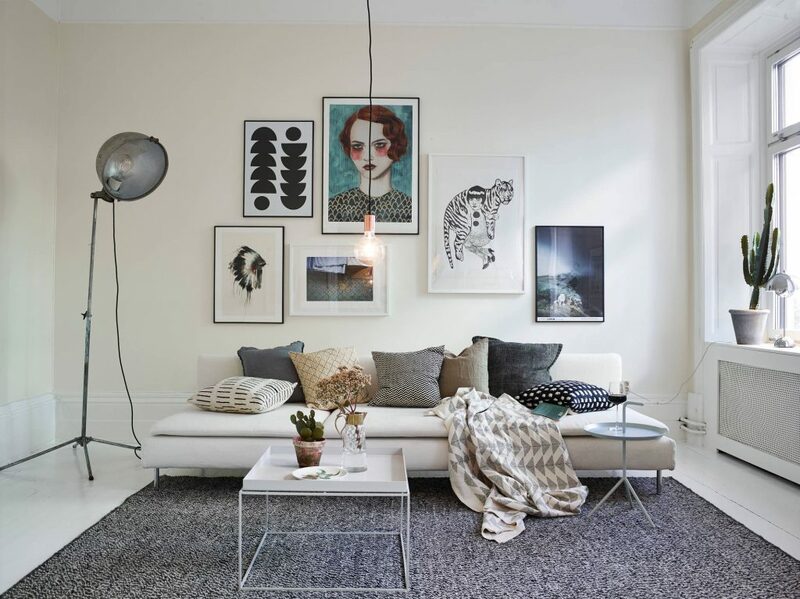 Making use of irregular spaces lets you fit a gallery wall into a small apartment. Don’t have much free wall space? Build your gallery around a window, door or a larger piece of furniture. Try to choose a spot that gets good light (natural or artificial) that will show your art to its best advantage. Symmetric – A symmetric grid layout conveys a sense of formality. It works best with an even number of images in matching frames of the same size and style. It’s also a perfect way to highlight a connected set of images. Salon Style – An eclectic, irregular arrangement has a more organic flow. Its casual nature gives you chance to mix things up with different sizes, orientations and frame styles. An odd number of images works best here. 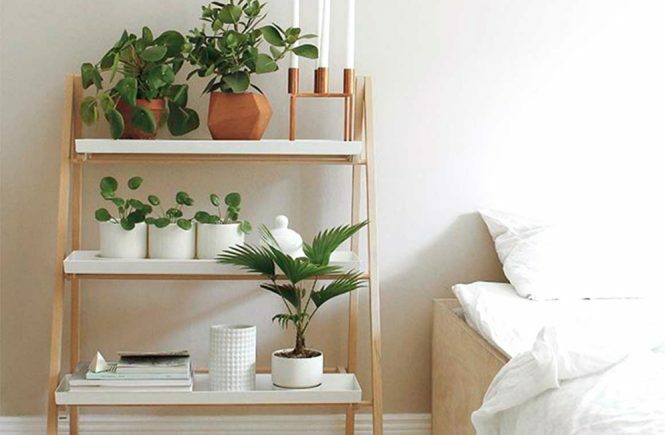 Think about bringing in some 3D objects such as mirrors and small shelves, too. Salon style gallery wall with lots of 3D art and texture. This is the fun part! The only real “rule” here is to curate a collection of images or objects that have meaning to you personally. When you’re out at a cafe or homeware shop pay attention to how they’ve arranged their wall art and snap pictures. Take your time and get a feel for what’s out there. If you’re planning on the symmetrical look, you’ll want images in the same medium (all photo prints, all watercolors, etc.) for the sake of uniformity. For a more modern look, find art within one color palette, or try pieces of the same size that are from a single collection or have a unified theme. With an irregular layout, you’re free to mix together nearly anything: photographic and graphic design prints, drawings (including your kids’ crayon drawings), family photos, street maps, watercolors, and whatever else draws your eye. For any 3D elements, give some thought to material and texture, such as wood, fabric and metal. It could be something practical such as a clock or a LED light or just decorative such as carved wooden letter, potted plants or a stag’s head sculpture. Aim for a good mix of horizontal, vertical, and square orientations. With a lot of minimalist printable art, you can print the image on a larger paper size, then cut away the excess to fit a square frame. And last but not least, choose an anchor piece — a piece that’s bigger or bolder than the rest — to act as a focal point for your gallery. If you want completely eclectic, artsy, boho-chic look, you don’t need to worry so much about finding anything in common between the images you choose, but you’ll still need to have a good feel for which pieces work well together. Otherwise, to give your wall a cohesive flow, your pieces need to have at least one thing in common with each other. The connection can be color, style, subject matter or even frame style. It doesn’t even need to be the same thing throughout the entire gallery, either, just as long as each image has something in common with the others. 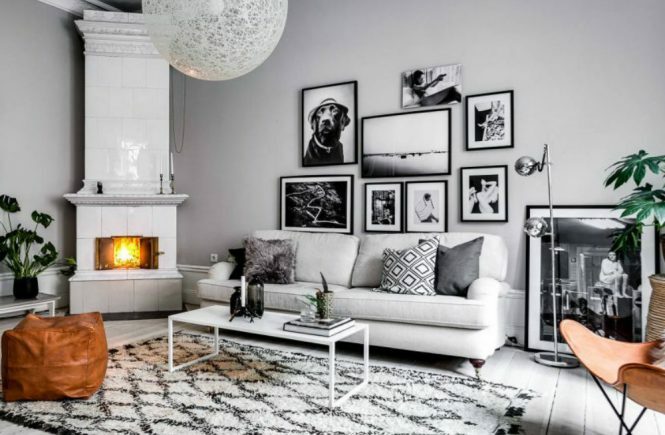 Soft grey art keeps the white wall from looking too stark. Beyond choosing art that fits the room’s color palette, use color to influence the mood of the space. Even in a dark, narrow hallway or cramped kitchen, you can create an airy, up-beat atmosphere with a gallery wall based on minimalist designs, bright colors, and plenty of white. Which brings us to white space. Try to get a good balance between prints that fill their frames with rich colors and busy patterns, and simpler designs surrounded by white space. Too many bright, noisy images can make the gallery looked cramped and weighed down. Even one print that’s primarily white space can balance things out. Typographical prints and “single centered image” prints are often perfect for adding white space. 2) choose a layout and find art work that will fit into it. No need to re-invent the wheel here. There are endless gallery wall layout ideas floating around the internet and a little browsing to find one you like will save you the headache of designing your own. Just like with wallpaper print, smaller image sizes make the room feel smaller and cozier, while larger sizes help open it up. The wall size matters, too. A collection of small prints will virtually disappear on a big wall. A few large photos create a spacious, airy feeling while small photos give the room a sense of coziness. For visual balance, try to get at least two images in the same size. This is one of major benefits of downloadable printable art. You’ll have files that let you print your art in a variety of sizes and, with some designs, different orientations. That way you aren’t stuck deciding between two A4 vertical prints you love just because your layout only has room for one. Just print one smaller, larger or as a square and enjoy them both. When you design your layout, start with your anchor piece. This is the image the eye will be drawn to it first, so you want everything to orbit out around it. For a salon style layout, you’ll want the images aligned along the top, the bottom or a center line, but not both top and bottom. The shelf and wall-mounted lamp on either side of this gallery wall help connect it with the rest of the room. Your gallery wall should flow with the rest of your room, too. In the living room above, the shelf with its own art and the wall-mounted lamp connect the gallery wall with the rest of the room. Color helps, but arranging the art to flow with the form of a bookshelf or cabinet or installing lighting in front of it really gives the wall a professional touch. In a symmetrical layout, uniform frames continue the neat and organized look. For monochrome artwork, thin frames in black or white are ideal. 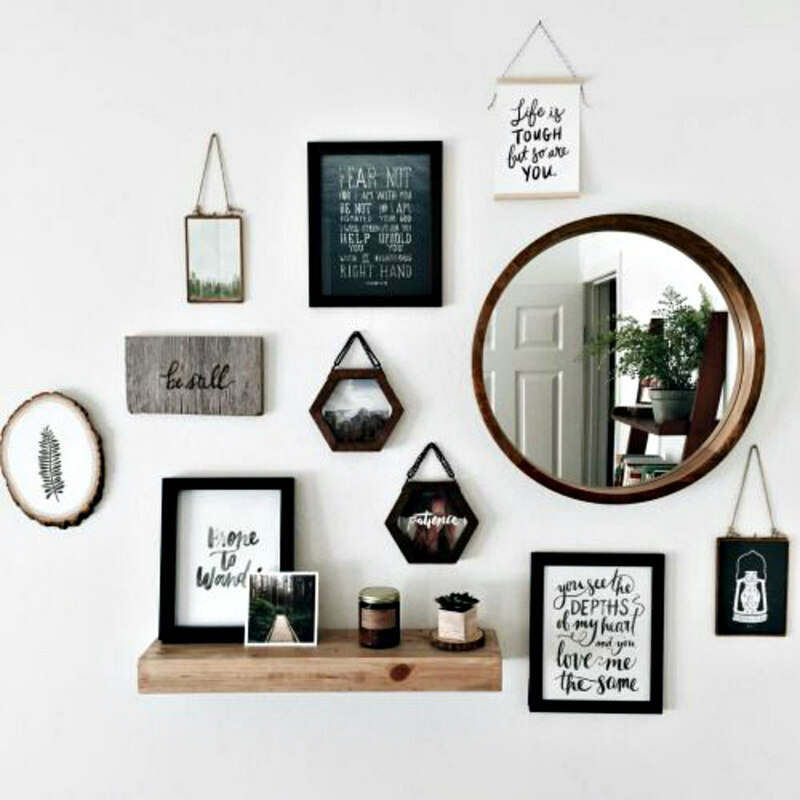 If you want to give your black-and-white gallery wall a little warmth, though, mix wood and gold-toned frames. In a more casual gallery wall, you just want to make sure your frames (and matboards, if you use them) share some common element that ties them together visually, such as material, color or width. Stick with two or three styles to keep things from looking messing (unless a sense of carefree chaos is your goal). If you use different colors, stay within the same color palette. Keep frame thickness uniform so you don’t have one that sticks out when seen from an angle. Of course, you don’t necessarily need frames. You can pin your art to a corkboard, hook it on a peg board, clip it to a metal grid, stick it to the wall with washi tape, mount on clipboards or use clothes pins to attach it to a string of fairy lights or twine. Mounting your art on shelves is another way to create a gallery wall that’s easy to change up whenever you want. If you go this route, try layering your art by laying frames on top of each other. You’ll get a more casual and very “modern Scandinavian” vibe like this. If you’ll be using printable art, you can print on cardstock so the images will stand up without frames. Don’t have a shelf available? Get some of art shelves/photo ledges (thin, notched shelving designed for displaying art). Want a quick summary of the gallery wall design process? Studio McGee explains it all in three minutes. This is critical: before you attempt to hang anything, perfect and test your layout. Put your art in their frames and lay everything out on the floor or a large table. When you have everything the way you want it, take a picture to use for reference when you start hanging. If you want to take it a step further, use newspaper or butcher paper to cut out paper templates of your art and tape those to the wall in the layout you want. It takes a little extra time, but it can save you from ending up with a layout that just doesn’t work on that particular wall. It’s a lot easier to reposition taped pieces of paper than frames hung on nails. Another tip: to keep the frames level more easily, hang them with D-rings instead of wire. Most galleries hang art so that the center of the piece is 150 cm (59 inches) from the floor, which will put it at eye level for most people. If you’re placing your gallery on the wall behind a sofa, bed or cabinet, though, just try to keep it at least 30 cm (12 inches) above the furniture or 15 cm (6 inches) if you’re working with a small room. 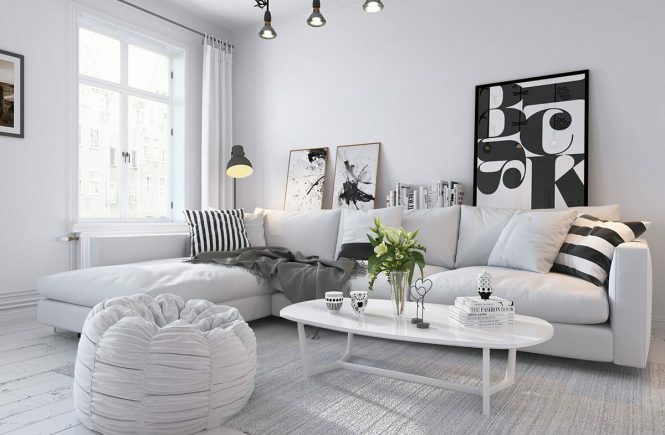 On the other hand, rules are meant to be broken, as in this living room in Sweden where the gallery wall is almost touching the sofa. It gives a large, airy room a more cozy feel. 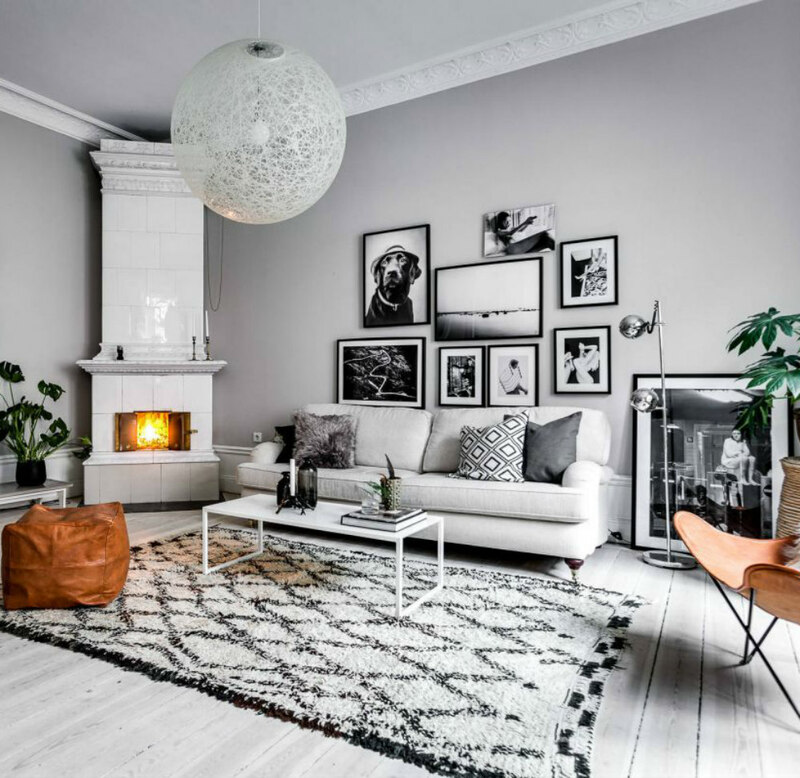 A gallery wall of black-and-white photos suits this Swedish living room that mixes a contemporary aesthetic with touches of mid-century modern design. And that lovely, cozy kakelugn. For a gallery you want to have staggered up the wall beside a staircase, keep the center at around 150 cm (59 inches) from each step with the frames’ bottom edges at least 25 cm (10 inches) from the steps so you don’t bash into them with the vacuum cleaner. Leave an equal amount of space between each of your frames to keep things looking neat. Place your frames at least 3 cm and ideally more like 5 cm (1 1/4 to 2 inches) apart. The lower end of that range is fine if you want to create a cozy look in a small room. For easy measuring, cut painter’s tape in the length of space you want between each frame. This is much more practical than fussing with measuring tapes or rulers, and you’ll get more precise results. Hang your anchor piece or a bottom piece first. Working from the lowest row upward makes it easier to build your layout so that everything is even and well spaced. If the largest image or the bottom row are tilted, the whole gallery will lean. Now stand back and admire your work! A gallery wall is never-ending work in progress. Keep it fresh by swapping out older pieces for new ones and bringing in seasonal prints every few months. 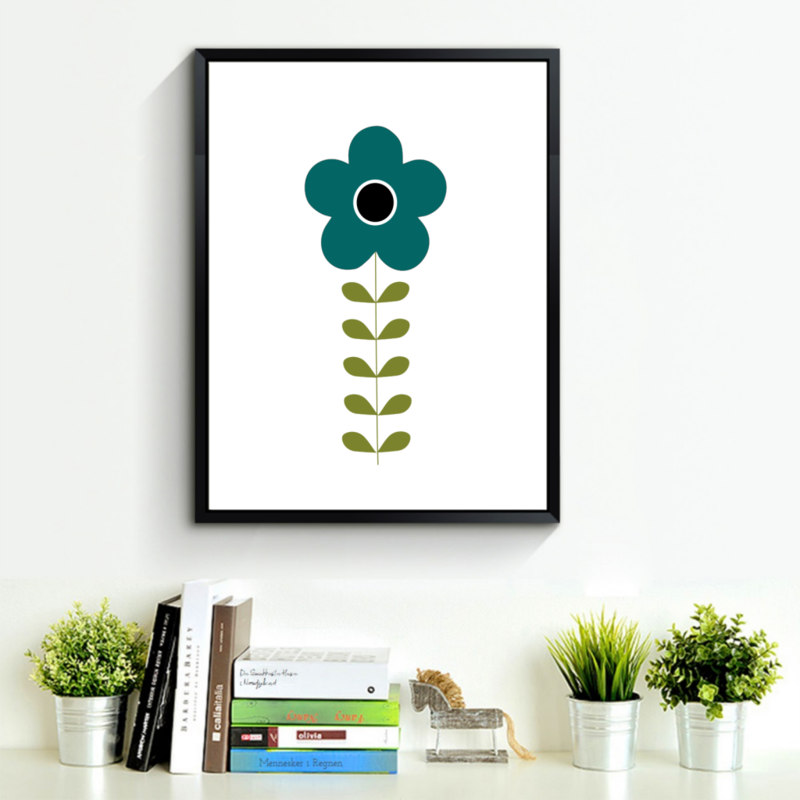 Swedish folk-inspired flower in bold blue available in the shop as a printable download.